Combine 1/2 cup water with 1/2 cup sugar in a small saucepan on the stove. Heat over medium heat, stirring occasionally, until the sugar dissolves. In a bread pan, combine the lemon juice and 2 cups of water. Pour in the simple syrup made in step 1 and stir well. Using a fork, crush the raspberries with the tongs. Add to the lemon mixture and stir well. Place the pan into the freezer and freeze for 1 hour. Stir with a spoon. Return to the freezer and continue to freeze, pausing every 30 minutes to scrape with the tongs of a fork. Serve straight from the freezer once fully iced over. It’s hot. No. Really hot. So hot, you could probably fry an egg on my sidewalk. As I write this, we’re in the throes of a heat wave here in New England and it’s miserable. If there was ever a time for a cool treat, now is it. One of my very favorite cool treats to make at home is granitas. These easy, flavorful, icy treats are often enhanced with fresh fruit like watermelon or berries, and frozen to a slushie perfection. It’s a homemade bowl of icy goodness. So, how do you make granitas? You start by making a sweet liquid, often using sugar or a simple syrup, fruit and water. Then you can add other flavors as desired such as berries. You can also make granitas from juices. 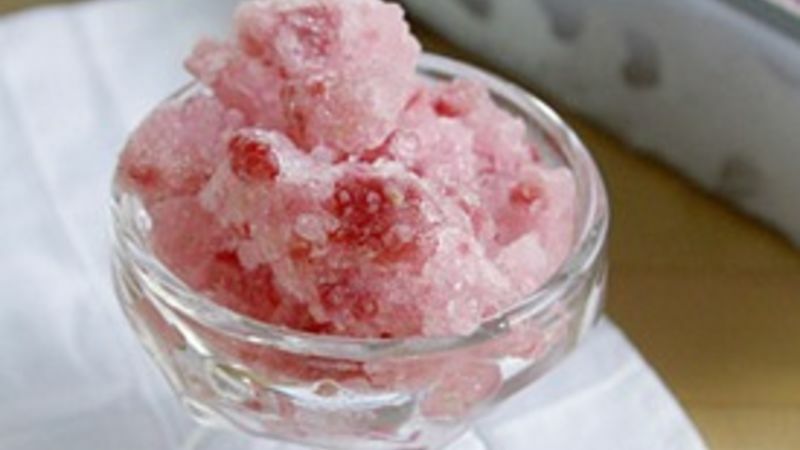 Once you have your granita mixture made, you have to freeze it. Pour it into a freezer-safe container and slide it into the freezer. Let it sit for 1 hour without disturbing and then stir it with a spoon. Then, leave it in the freezer for 30 minute intervals, dredging it up with a fork, until it’s all frozen and slushy. Scoop the granita into serving dishes and enjoy immediately. Leftovers should be stored in an airtight container in the fridge and eaten within a week or two.